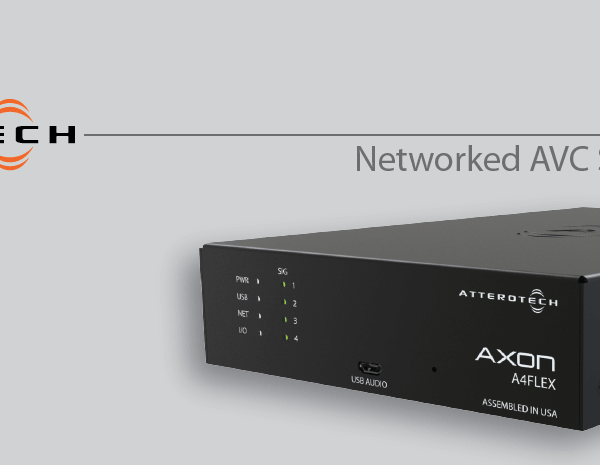 The Attero Tech AXON A4FLEX is a compact and scalable mic/line connectivity solution for Dante™ and AES67 networked AVC systems. With four mic/line inputs (two of which are flex I/O and can be outputs), USB and AES67 audio and control interfaces, logic inputs and outputs, and a two-channel power amplifier the A4FLEX is equally suited to be the heart of a huddle space, small conference room, or I/O extension to a wide variety of DSP platforms. The A4FLEX can be a key part of conferencing and presentation systems in corporate, higher ed, hospitality and courtroom venues.